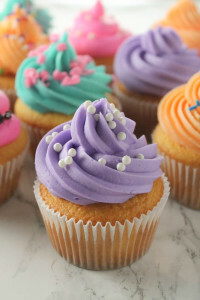 Cupcakes are one of my favorite desserts. I love eating them, I love making them. They’re my jam. My thing. While they’re small and simple, they can be a little intimidating. 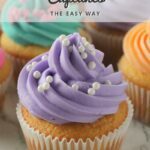 I’m not a cupcake pro, but I’ve been making cupcakes for years I’m happy to share a few tips and tricks that will take your cupcakes from good to great. Sometimes the actual cakes in cupcakes get overlooked. I admit, in my eyes cupcakes are pretty much a frosting delivery system, but that doesn’t mean the cake should be dry and boring. I almost always make my cupcakes from a boxed cake mix. 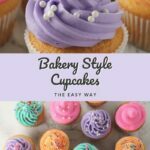 It’s so easy and quick, and with a few tweaks it can taste just as delicious as a real bakery cupcake. I’m usually a big fan of store brands, but I do have a strong cake mix brand preference. Pillsbury is my personal favorite in every flavor, and I always end up regretting it if I stray from the tried and true. Bake your cupcakes according to the directions (they’re done when an inserted toothpick comes out clean), and I promise they’ll be the best cupcakes-from-a-box you’ve ever had. After the cakes come my favorite part, the frosting. My go-to is my No-Fail Buttercream Frosting recipe. It’s delicious, easy to pipe, and easy to color and flavor. 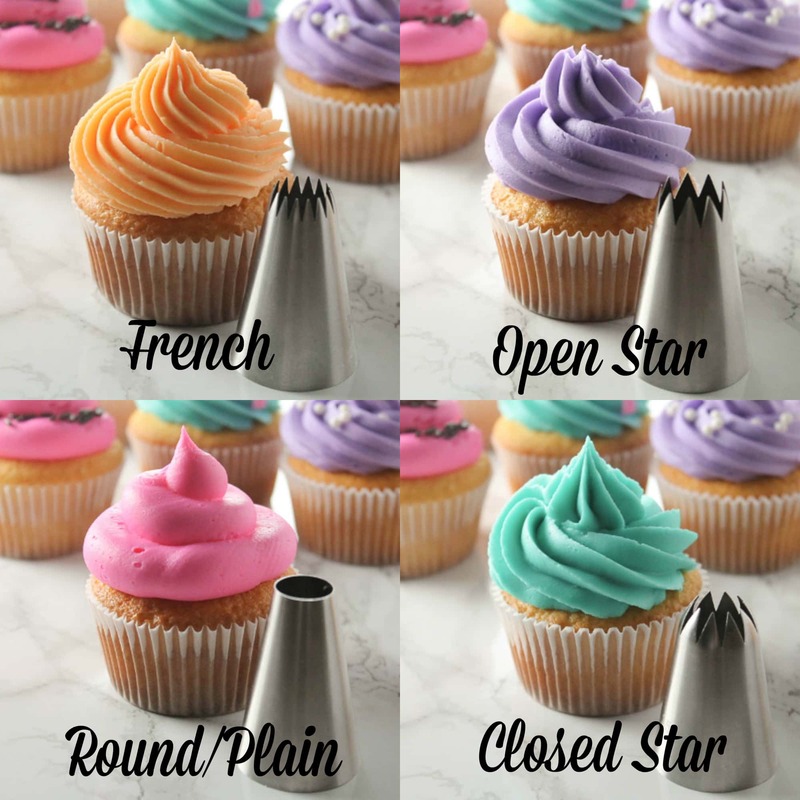 One of the best things about buttercream frosting is that it can be flavored so many different ways. Just substitute the emulsion or extract of your choice for the vanilla. While I usually go with my favorite Butter-Vanilla emulsion in my buttercream frosting, I also really love using a raspberry or lemon flavor. For these photos I made 1 1/2 batches of frosting, divided it into 4 small individual bowls, and colored the frosting in each bowl with 2-3 drops of gel food coloring. I personally like to use gel food coloring because it’s so concentrated, but you can use liquid or paste coloring. Once your cakes and frosting are ready, it’s time to start piping. My #1 tip for frosting beautiful cupcakes is having the right tip. The key to professional looking piping is jumbo tips. Not large, jumbo. I have this set of jumbo tips and it’s served me well. 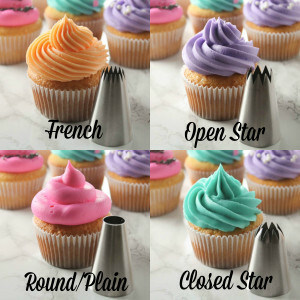 If you’ve never piped cupcakes before, or you just want to use the easiest tip, I say go with the round tip, it always seems to turn out. 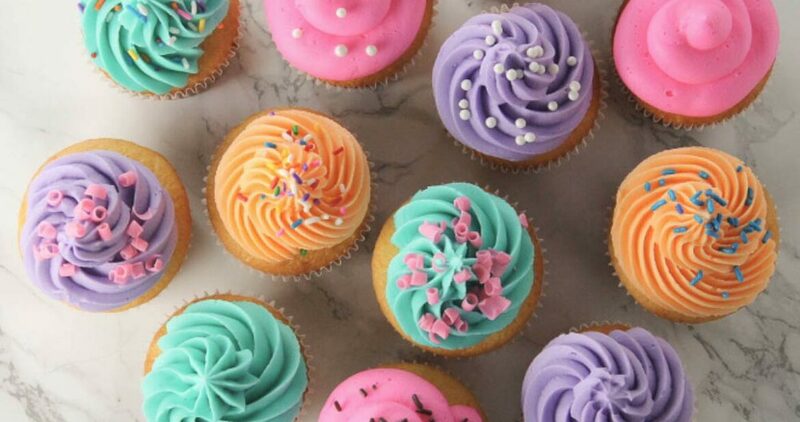 My #2 tip: Make sure your cupcakes are totally cool before frosting. The last thing you want is your precious frosting sliding off of a too-hot cupcake. After I fill the piping bag with frosting, I work the frosting a little with my hands directly before piping it. It warms up the frosting a little so the piping is always smooth and easy. 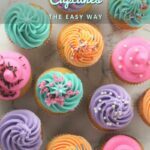 Piping with the jumbo tips takes a little practice, so if you’ve never done it before, make extra frosting and do some practice swirls. Hi Linda, you can get the curls at JoAnn’s or another store that sells cake decorating supplies. Have fun with your cupcakes! It was SO good!! Your pictures are absolutely stunning and I am so jealous! Thanks again for making my birthday so special! How far in advance do you frost the cakes? It’s it too early to do this the day before? Hi Kris, frosting the day before is fine. Great advice! Quick question though. Do you substitute unsalted or salted butter? Thanks. We usually use salted butter, but unsalted works as well. 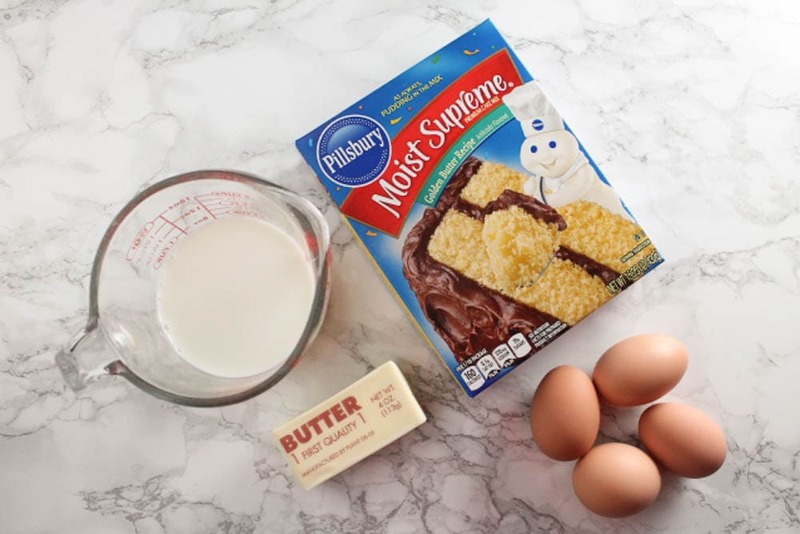 If you use unsalted butter, I would recommend adding 1/4 teaspoon salt to the frosting to offset some of the sweetness from the powdered sugar.